About Us | Brussels Agri Services Ltd.
We are a feed, farm and fence supply business located in Brussels, a small town in Southwestern Ontario. Our building is part of Brussels Livestock, which is one of southwestern Ontario's largest privately owned stockyards. We are proud to be dealers for the following companies: Masterfeeds, Gallagher Fence, Arrowquip, Speare Seed & Weaver Leather / Livestock. We were established in 1992 under the ownership of Jim Chambers. In Sept of 1995 Tim Prior joined the business and became our Fence Supply & Install Representative. Tim brought with him an established Gallagher Fence Business which complimented the existing business. In the fall of 1997 Tim Prior purchased the business from retiring Jim Chambers. Tim expanded the store and added a larger feed room to accommodate our growing customer base as well as a feed truck which we use to supply bulk feed to our customers. We continue on with our success in the fencing industry by being a leading fence installer and supplier. We are also proud to be the largest independent Gallagher dealer in North America and have recently become a Passion For Pasture Pro Dealer, specializing in pasture management and rotational grazing solutions. Our full line up of products include everything for your farm needs, including: livestock processing equipment, EID and weighing devices, gates, feeders, water bowls, fence supplies, animal health products, pet products & feed, CCIA & livestock management tags, plus much more. With the support of our customers over the years we have expanded our product lines to make Brussels Agri Services Ltd. your one stop shop. One of the largest additions to our business was the creation of the Cowboy Loft in July of 2003. We offer a full Western Tack shop where you will find everything for your horse, including supplements, feed, grooming supplies, full tack and much more. The Cowboy Loft also offers a unique selection of clothing, boots, footwear, hats, belts, purses, jewelry, giftware, home decor & more. Our large selection of jeans can take you from riding to show ring ready to stylish everyday wear. We carry quality brands such as Wrangler, Ariat, Grace In LA, Cruel Girl, Cinch & Stetson. We have also expanded to bring our beef, dairy and sheep clients the full line-up of Weaver Livestock and Sullivan's products to get them show day ready. From the beginner in 4-H to the expert and seasoned showman, we have everything you need to prepare yourself and your livestock for showday! We continually strive to gain more knowledge in our various fields to provide our customers with quality service. Our friendly and knowledgeable staff is here to help you! And remember if you don't see it, just ask, as we provide custom order services on a wide selection of products. 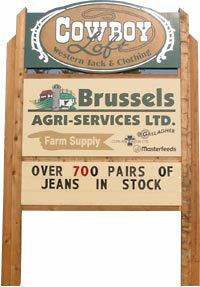 Come to Brussels Agri Services Ltd. for a shopping experience you won't forget. We hope to see you soon!